In the aftermath of Hurricane Florence, Jaret Hucks provided free housing for flood victims at his 70-room Midtown Hotel. Amy Van Schoick collected and distributed clothing. Joe Falcone patrolled neighborhoods looking for flood damage and suspicious activity. These good Samaritans, along with so many others, stepped up amid the devastation. 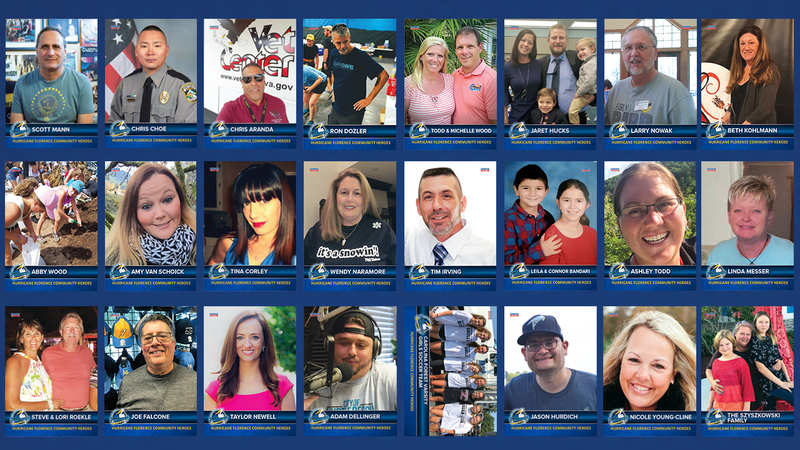 Hucks, Van Schoick and Falcone are three of the 24 individuals featured in the Myrtle Beach Pelicans' first-of-its-kind Community Heroes Card Set. On Saturday, the Class A Advanced Chicago Cubs affiliate gave away 1,000 sets and honored the community heroes during a pregame on-field ceremony. "Hurricane Florence itself didn't do a ton of damage locally, but the floodwaters that followed were devastating to the surrounding area," Pelicans general manager Ryan Moore said. "Hundreds, if not thousands, of people lost their homes. The local, state and federal governments were all here to help, but they can't do it all. So many people came together to help their neighbors. We wanted to highlight people who were doing things like sandbagging for days on end or delivering food to first responders working 24-hour shifts." The Pelicans are one of dozens of Minor League teams who have given away card sets honoring local military members in recent years. The Community Heroes Card Set was an extension of this concept. "We put out the call to our fans to nominate who they thought should be honored," said Moore, who helped oversee an offseason Hurricane Florence benefit concert that raised over $128,000. "We received over 100 submissions, and it was definitely a difficult process to narrow it down." Last month, The Pelicans' card set caught the attention of The Weather Channel's "AMHQ" morning show. Moore was interviewed in a March 19 segment, during which he unveiled the first four cards in the set: police officer Chris Choe, third-grader Abby Wood, siblings Leila and Connor Bandari and the aforementioned Hucks. The positive energy carried into the weekend. Proceeds from Saturday's 50/50 raffle were donated to the Myrtle Beach region's ongoing flood relief efforts. The following evening the Pelicans honored local meteorologist Ed Piotrowski with his own bobblehead. Piotrowski had just returned from the National Tropical Weather Conference, where he had received an award for his outstanding television coverage before, during and after Hurricane Florence. "We want to recognize the people who went above and beyond in our community," Moore said. The Pelicans' Community Heroes weekend has come and gone, but there are plenty of Minor League promotions to look forward to. The remainder of this column features one highlight from each night of the week. April 8: If you're fortunate enough to attend the first home game in Amarillo Sod Poodles history, you're going to want a souvenir. The team is giving away commemorative Hodgetown ticket stubs as keepsakes. April 9: The most absurd promo of the week comes courtesy of the Akron RubberDucks, who are staging Flix and Chili Night. The team describes the evening as "a celebration of our fans' favorite Netflix scenes and use of beans!" April 10: Continuing with the absurd, the New Hampshire Fisher Cats present Obsolete Night. The team promises a "celebration of all things outdated," including fax machines, video stores and flip phones. Check the team's MySpace page for more information. April 11: The Altoona Curve kick off their home season with an action-packed evening at Peoples Natural Gas Field. Fourteen-year-old Taylor Mowry, fighting a rare nerve disease, will sing "America the Beautiful". Meanwhile, Pittsburgh Pirates pitching and broadcasting legend Steve Blass will throw out the first pitch, meet with fans and join the broadcast. April 12-14: During the Daytona Tortugas' Jackie Robinson Weekend, the entire team will honor Robinson by wearing No. 9, the number he wore when he spent 1946 Spring Training in Daytona Beach. Saturday brings a Jackie Robinson statue giveaway, modeled after the statue that stands in front of the Tortugas' Jackie Robinson Ballpark. On Sunday, the team will give away No. 9 replica shirts. April 13: The Louisville Bats, paying tribute to their city's most iconic mixed drink, suit up as the Derby City Mint Juleps. April 14: The Hickory Crawdads are celebrating duct tape's 77th birthday. The ubiquitous adhesive was first manufactured by Johnson & Johnson in 1942.